MidNite Classic 150 MPPT All in One Charge Controller Board for Solar. Comes with MidNite Solar Battery Temperature Sensor. This is our pre wired DIY solar board b. Y Missouri Wind and Solar, the largest DIY wind and solar store in the USA. We have done it again, a pre-wired all in one charge controller board for the DIY guy, the Original. Due to customer demand we created this board to take the guess work out of it for you. This board will allow for up to 3 strings of 150 volt PV power to be combined and sent to the MidNite Classic 150 charge controller for up to 96 amps of battery charging capability. The Classic 150 is designed to work with 12, 24, 36, 48, 60 and 72 volt battery banks. (1380 watts of solar input power). (2700 watts of solar input power). (4847 watts of solar input power). The PV incoming power is routed through three separate breakers, then converted by one of the most advanced MPPT charge controllers on the market to the most efficient charging algorithm and charging amperage available. This board connects to your battery bank, routed through a DC circuit breaker, for added security and fire protection! This step is often neglected and is essential to installing to code. Heavy gauge cleanly galvanized steel back/mounting board with folded ends and pre-punched wall mounting holes. Two MidNite Solar PV3 combiner boxes. 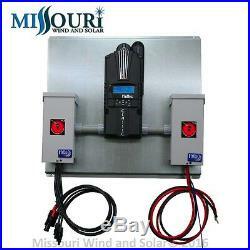 Allow 3 strings of solar input of up to 150 volts input for the MidNite Classic charge controller. One box houses a MidNite 100 amp double pole breaker. On the battery side of the controller. For safety that also serves as a convenient disconnect. The other combiner box houses three 150 volt MidNite PV breakers that also serve as convenient separate solar string disconnects. One of the most efficient MPPT controllers on the market. 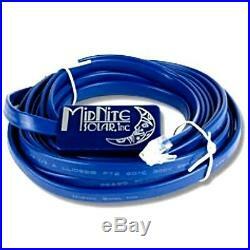 Heavy duty pre-wired #4 gauge flexible battery cables with lugged & heat shrink sealed battery ends. 3 sets of 3 foot solar PV cable extensions pre-wired with MC4 connectors. All components are internally grounded to the board which allows for easy grounding. Wiring is housed in electrical EMT conduit. Plug and play: Simply bolt or screw unit to the wall and make your PV and battery bank connections. Perfect for on grid or back up power, off grid, boat and RV use. MidNite Solar's battery temperature sensor ensures batteries do not overheat in charging cycle. Maximizes performance for your inverter or charge controller. Sensor is attached to a 15' cable. The Classic MPPT Charge Controller - 150 substantially increases the flexibility, features and range currently found on MPPT controllers at an incredible price. Max current out: 96 amps. ETL listed to UL1741 and CSA. Exclusive HyperVOC extends VOC limits. Built in DC-GFP and Arc Fault Detector. 14.9"L x 6"W x 4D. Listed by ETL for US & Canada. Midnite Solar Battery Temperature Sensor. This battery temperature sensor will help to maximize performance for your inverter or charge controller. This sensor is attached to a 15' cable. UPS orders are signature required at our discretion!! Products may be slightly different than the ones pictured. If our supplier runs short of the products shown, we will substitute them for the same quality or better. The item "MidNite Solar Classic 150 MPPT All in One Charge Controller Board for Solar" is in sale since Friday, June 24, 2016. This item is in the category "Home & Garden\Home Improvement\Electrical & Solar\Alternative & Solar Energy\Chargers & Inverters". The seller is "missouriwind" and is located in Seymour, Missouri. This item can be shipped to United States, Canada, United Kingdom, Mexico, Germany, Japan, Brazil, Australia, Denmark, Romania, Slovakia, Bulgaria, Czech republic, Finland, Hungary, Latvia, Lithuania, Malta, Estonia, Greece, Portugal, Cyprus, Slovenia, Sweden, South Korea, Indonesia, Taiwan, South africa, Thailand, Belgium, Hong Kong, Ireland, Netherlands, Poland, Spain, Austria, Bahamas, Israel, New Zealand, Singapore, Switzerland, Norway, Saudi arabia, Ukraine, United arab emirates, Qatar, Kuwait, Bahrain, Croatia, Malaysia, Colombia, Panama, Jamaica, Viet nam, Uruguay.